Traditionally, scientists have estimated nutritional requirements for every age, size, class, and breed of dairy animals through research done in a conventional, confinement system. Although this research does not account for many of the organic or grazing systems, it provides a starting point. Nutritional requirements are set by the average herd needs. There are three different rations (formulated, fed, and consumed) because animals do not read computer printouts, people are not always consistent, and sometimes the animals know better than we do about what they want and need to eat. To maintain healthy animals, consistency in management and nutrition goes a long way, and may be more critical than exactly meeting all nutritional requirements. It is important to offer a consistent diet to dairy animals and meet the needs of the group average. To do this, the nutritive values of forages must be known and nutrients lacking should be supplemented. The amount of feed cows receive on a daily basis should be as consistent as possible, especially for lactating cows. If dry matter intake changes frequently, the nutrient supply also changes. The result of an inconsistent diet is inconsistent milk production, inconsistent growth, and stress that may lead to health issues. Forage-sample results are a starting point for developing rations for animals on the farm. They help prioritize which forages to feed to different groups of animals, feeding the best quality to those with the highest nutritional needs such as calves and milking cows. The forage test reports list important nutrients such as protein, energy, fiber, and minerals, and can be used to formulate a basic ration either by hand or with computer software. Table 1 identifies the recommended minimum forage quality needed to be produced to keep purchased feed costs low. It is helpful to compare current forage nutrients to the recommendations to determine whether or not nutrients will need to be supplemented. Table 1. Minimum recommended forage quality for organic milk production. Lactating dairy cows have the most complex nutritional requirements and their requirements change through early, mid, and late lactation. Thus, it is difficult to balance one ration for a whole herd or group of cows without over- or under-feeding some of them at all times unless the operation is a seasonal dairy. The greatest demand for nutrients comes 50 to 90 days after the cow calves, when she approaches and is at the peak of her milk production. Energy and protein needs are greater than what she can consume in her feed and body condition goes down. Early lactation cows mobilize body energy stores like fat and other tissue to meet those needs. It is critical to feed enough nutrients at peak production to minimize stress. Ensure that intake increases as quickly as possible after calving—offer high-quality forage and supplement with grain to boost energy and protein intake. Total dry matter intake of forage and grain at peak production should be between 3.5% and 4.0% of her body weight. Organic dairy farms often feed less grain than the average conventional farms, which requires extra attention during peak production. The following are some nutritional considerations for feedling less grain during peak production. Provide a grain-to-milk ratio at peak production of 1:4 or less (i.e., 1:5 or 1:6) provides extra nutrients less expensively. Feed some grain prior to calving so the rumen adjusts to it. Increase grain feeding rates by 1 pound every 3 to 4 days, otherwise metabolic problems such as acidosis and additional stress may compromise the immune system. Once cows pass peak production, they eat what they need for production, plus maintenance and breeding. Whereas before peak they were in "negative balance," they return to a positive balance after peak (see Figure 1), allowing them to start ovulating and returning body reserves. 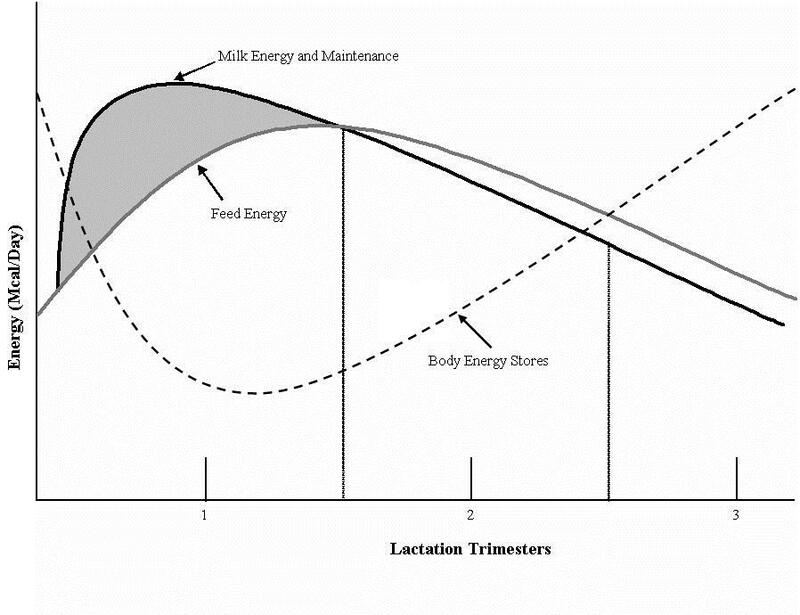 In Figure 1, the gray shaded area between the milk energy and feed energy lines represents the amount of energy that the diet is lacking compared to the need for energy for milk production – the negative energy balance (Hoffman et al., 2000). Figure 1. Generalized milk energy to feed energy relationship (Hoffman et al., 2000). At positive balance, a ration should be balanced for total dry matter intakes of approximately 3.25% to 4% of body weight that meet the guidelines listed in Table 2 -- this will allow the cows to breed back, gain condition, and produce milk. Table 2 includes nutrient ranges that account for differences in breeds and milk production. Generally, the lower end of the ranges are for smaller breeds or those producing less milk. Table 2. Lactating cow nutritional requirements. Source: National Research Council. 2001. Nutrient Requirements of Dairy Cattle, 7th rev. ed. National Academy Press, Washington, DC. If the farm has the ability to feed cows individually or group them by production, the data in Table 2 can be used to identify changes to make during different lactation stages. Example 1 below calculates a ration for cows at peak production when they have the greatest need for nutrients. Double-check rations to ensure they meet the protein and energy requirements. Check different subsets of cows, such as those in later lactation producing less milk. If forages are changed, re-analyze them and check that requirements are still being met. Lastly, be aware of other changes such as significant shifts in production or body condition and determine if the ration is still on target. Using Table 2, this example uses Holstein-Jersey crossbred 1,200 pound cows peaking at 80 pounds of milk on pasture (representative of the average performance of cows on many Northeast organic dairy farms). The example calculates for dry matter and then converts it to "as fed." Step 1. Determine total dry matter intake (DMI). Weight of cow x % body weight (using Table 2) = DMI. 1,200 pounds x 3.5% = 42 pounds DMI. During the pasture season, high-quality forage is on hand, so we can target 70% forage in the diet, which is 29.4 pounds of forage (42 pounds DMI x 70%) and 12.6 pounds of grain (42 - 29.4), a grain-to-milk ratio of 1:5. Step 2. Determine how many pounds of protein they need. Pounds DM x % protein (using Table 2) = pounds of protein. 42 pounds DM x 17% protein = 7.14 pounds of protein. Step 3. Calculate how much of that protein is met by forages. The forage analysis for this example is 21.4 pounds of 22% crude protein (CP) pasture, 5 pounds of 8% CP corn silage, and 3 pounds of 12% CP hay. The cows will eat 21.4 pounds of pasture dry matter (29.4 pounds DMI - 8 pounds other forage DMI). The calculations of protein are as follows. The ration is short of the protein requirement of 7.14 pounds (calculated in Step 2) by 1.67 pounds, so more protein will need to be provided by the grain mix. 1.67 pounds protein ÷ 12.6 pounds grain = 13% CP needed in the grain. A 13% CP grain mix would be affordable. If the pastures were higher quality in protein, at 27% CP for example, the ration would only be short by 0.60 pounds of protein and a little corn meal would help meet the requirements. Step 4. How much energy do they need from grain? Based on Table 2, they need between 35 and 38 Mcal per day. The pasture will provide 0.68 Mcal per pound, the corn silage 0.75 Mcal per pound, and the hay 0.53 Mcal per pound (see Table 1). 4a. To calculate the total energy in the forage, note the following calculations. The grain must provide at least 15.11 Mcal for the ration (35 Mcal/day - 19.89 Mcal/day from forage). 4b. To calculate the total energy needed in the grain, note the following calculation. It is important to note that the number above (1.20 Mcal/pound) is energy per pound of grain fed, not the total amount of energy in the total grain fed. Unfortunately, not many certified organic grain products meet this energy requirement, as energy density of grains is usually less than 1.0 Mcal per pound. Therefore, there are only a few options for this ration—feed more grain and less forage, improve forage quality to meet the guidelines in Table 2, or include molasses as an energy source. It may make sense to feed a higher grain rate, such as 1:4, until cows are past peak production and in positive energy balance. If no changes are made to the ration, it is likely that these cows would lose milk production, body condition, and/or have trouble breeding back. If formulating a grain mix is desired, a simple and old-fashioned method is Pearson’s Square (see Figure 2). Draw a box as below, with the amount of protein desired in the center. (In Example 1, a 13% CP mix was needed). On the left side of the square, list one ingredient and its protein content next to the top corner, and a second ingredient and protein content next to the bottom corner. From Example 1, corn meal (9% CP) and sunflower meal (28% CP) form the base of the grain mix. Follow the arrows diagonally across the box, subtracting the number in the middle of the box from those on the left side. Then add the numbers that result on the right. Figure 2. Pearson's Square used to calculate total CP. Corn meal = 15 ÷ 19 = 0.79 x 100 = 79% of grain mix. Sunflower meal = 4 ÷ 19 = 0.21 x 100 = 21% of grain mix. If more than two ingredients are to be used, the method is the same as above but repeat the Pearson’s Square after the first two ingredients are mixed. The corn meal/sunflower meal mix (19%) will be at the top left side and the third ingredient will be in the bottom left corner. If more than three ingredients are to be used, first calculate the average protein content of the two new feeds together, for each of the top and bottom places on the left side of the square, and then run the calculations as above. Table 3 (below) shows protein and energy values for common organic feed grains. Table 3. Protein and energy values for common organic feed grains. *Value is for conventional peas; data on organic field peas was not available. Source: National Research Council. 1989. Nutrient Requirements of Dairy Cattle, 6th rev. ed. National Academy Press, Washington, DC. To convert the ration for peak-lactation cows to an "as-fed" basis, the dry matter content of each feed needs to be known. If a forage test was performed for Example 1, results would likely reveal the pasture to be 20% DM, corn silage to be 35% DM, hay to be 84% DM, and grain to be 89% DM. The calculations for an "as-fed" ration are as follows. 21.4 pounds pasture ÷ 0.20	= 107 pounds as fed. 5 pounds corn silage ÷ 0.35	= 14.3 pounds as fed. 3 pounds hay ÷ 0.84	= 3.6 pounds as fed. 12.6 pounds grain ÷ 0.89	= 14.2 pounds as fed. This process works for all major nutrients to check if nutritional requirements are met. The general rules of thumb for other nutrients include the following. Minerals and vitamins for milking cows are not usually formulated to meet their needs specifically, even by nutritionists. In most cases, nutritionists or feed sales representatives include a pre-mixed mineral and/or vitamin mix. Make sure the pre-mix is approved by your certifier because the National Organic Program (NOP) does not allow certain anti-caking agents such as yellow prussiate of soda. The NOP also does not allow mineral oil or synthetic (artificial) flavors or colors or slaughter byproducts, which are found in some mineral mixes. Kelp is often fed free choice because it provides a broad spectrum of minerals, vitamins, and anti-oxidants that provide both nutrition and immune system benefits. It also is frequently mixed into a grain or mineral mix. As cows approach the end of their lactation, they should have good body condition, but not overly fat. If they still milk fairly close to 60 to 45 days before their due date, the ration can be changed to help them reduce their production before drying off. Body condition should score around 3.5 to 3.75. For thinner cows: Feed more energy to increase body condition before drying off. Milking cows gain weight more easily because their metabolism is still high and they convert energy to fat more easily. Metabolism slows down in the dry period and trying to increase condition at this stage will require more feed. For fatter cows: Reduce the amount of energy in their diet to drop body condition. Fat cows in the dry period may develop health and/or metabolic problems, including fatty liver and ketosis after calving and into the first month of lactation. For high producers: Restrict intake and feed lower-quality forage. This will minimize udder pain when dried off, and minimize the chance of mastitis in the next lactation due to related stress or immune system effects. To dry-up a cow quickly: Restrict water intake, but no more than a 30% reduction in water intake, as other health problems due to dehydration may result if water is more limited. There are two stages of the dry period to consider from a nutritional standpoint. The first of these is the early dry period or the first 30 days after cows dry off. The second is the transition or close-up period, the final two to four weeks before the cow calves when her nutritional requirements increase. Cows can be maintained on forages and minerals alone. The more challenging part of the dry period is the transition or close-up period. To manage cows during this time, it helps to understand the metabolic changes a cow undergoes during the transition as follows. Through the dry period, the cow primarily uses nutrients for fetal growth. The unborn calf grows rapidly during the last trimester (90 days) of gestation. Protein and energy requirements significantly increase as calving date approaches. Dry matter intake decreases as calving approaches, so cows require a higher nutrient density ration. Table 4 lists the recommendations for ration formulation with transition dry cows. The dry period is important because many metabolic changes occur. If cows are managed poorly, these changes can get out of hand and lead to metabolic disorders. Immediately before calving, the cow dramatically drops her dry matter intake as much as 70% compared to just two to three days before. This drop in intake causes the cow to begin mobilizing body fat for energy, which breaks down into non-esterified fatty acids (NEFA) that release into the blood. Body fat mobilization also releases glycerol for energy. NEFA in the blood increases with less intake, and the longer the intake is reduced, the longer NEFA is elevated. The liver absorbs NEFA and converts it either to usable energy, ketone bodies, or triglycerides. When NEFA levels are too high, the liver makes more triglycerides which are stored in the liver leading to fatty liver syndrome. High levels of NEFA have also been associated with other metabolic disorders such as dystocia, retained placenta, ketosis, displaced abomasum, and mastitis. The cost of these disorders is high and thus worth managing transition cows properly (Overton and Waldron, 2004). Under organic management, it becomes even more critical to manage the transition period well to avoid these disorders. Another important strategy in controlling NEFA levels is to ensure that cows receive the dietary precursors of glucose before and after calving. Glucose is the primary energy source for both fetal growth and milk production and is primarily made in the liver from products of rumen digestion. If dry matter, carbohydrate, and protein intake levels are all sufficient, the cow’s liver will make glucose and minimize the mobilization of body fat, and thus NEFA levels (Overton and Waldron, 2004). Major diet changes around calving time can have a negative influence on dry matter intake. Changing forages, TMR recipes, or concentrates can put a cow off feed for a few days. This is especially important with grazing herds because fresh pasture forage is significantly different from stored forages. If close-up dry cows are fed stored forages before calving, the switch to fresh grass after calving may cause them to decrease their intake significantly. Likewise, close-up cows on grass that are confined after calving also drop their total intake. Thus, it is best not to change the diet for transition cows. Dry cows on pasture should stay on pasture after calving, and dry cows on all stored feeds should continue with stored feeds for the first 21 days of lactation. From a practical standpoint, producers have had good results letting close-up dry cows graze in paddocks the milking cows have already grazed. They put the dry cows on the paddock during one grazing period per day (i.e., days or nights only), and feed additional forages and grain in the barn the other part of the day. This ensures that the dry cows have some fresh forage in their rumens, but also receive a diet balanced for protein and carbohydrates. This works especially well for farms that do not have extra acreage designated for dry cow pasture, or where the traditional dry cow pasture is of poor quality. Producers with additional pasture may keep dry cows out all the time and deliver the remainder of the ration to an outdoor feedbunk or feed wagon. A concern for close-up dry cows is the mineral content of the diet. Potassium (K) levels should be as low as possible—less than 2% K—to minimize the risk of milk fever. Forages from fields with high rates of manure application should be tested for K before feeding to dry cows. Potassium’s effect is to tie up magnesium (Mg) and make it unavailable to the cow. When K levels are high, Mg can be increased to compensate for the effect. See Table 4 for the K and Mg requirements of close-up dry cows. Selenium and Vitamin E are important supplements during the dry period to boost the immune system of the cow and help the calf after it is born. Selenium and Vitamin E prevent the calf from developing white muscle disease and the cow from developing metritis and cystic ovaries. In the Northeast, soils are typically deficient in selenium, making forages grown there also deficient so it needs to be supplemented in the diet. Most vendors comply with the legal limit of supplemental selenium (0.3 mg per kg or 2.2 pounds of DM) in purchased feeds or minerals. Check with your certifier for approved sources of selenium and Vitamin E.
Managing transition cows is different for each farm based on its resources. Table 4 outlines the nutrient guidelines for transition cows. The key factors that determine a successful transition cow program are as follows. Feeding appropriate levels of protein and carbohydrates during the 42-day period. Table 4. Nutrient guidelines for early dry, close-up dry, and fresh cows. Note: Your nutrition advisor may adjust these amounts for your herd situation. a If on an anionic ration, ration calcium should be increased to 1.1–1.4%. Magnesium and sulfur would be increased to 0.4–0.45% and chloride up to 0.85%. b First 30 days in milk or until cows are coming on feed rapidly. c If DCAD formulation in close-up diet, increase Ca to 1.2 to 1.3% and use Cl sources to titrate urine pH. d FDA limit for added selenium (recommend organic source if available for dry and fresh cows). e Iron will generally not be added to the diet. Sources: Overton, T. R. and L. E, 2009. National Research Council. 2001. Nutrient Requirements for Dairy Cattle. National Academy Press, Washington, DC. Rations for dry cows in the early part of the dry period, approximately 45 to 60 days prefresh, are relatively easy to formulate because the cows' metabolisms have slowed down to maintain themselves and grow the unborn calves primarily. They can eat lower quality forages than other groups of animals on the farm and can reduce or eliminate their grain intakes. However, they still need their mineral supplements. The process of developing the ration is similar to the process used for milking cows (see Example 2 below). To develop a ration for dry cows, this examples uses the same 1,200 pound Holstein-Jersey crossbred cows as in Example 1, but assumes their body weight has increased slightly due to a gain of body condition and the increased weight of the calf. They are most likely closer to 1,300 pounds at the end of lactation, so the estimation of DMI is 26 pounds per day based upon this weight (1,300 pounds x 0.02). A typical feed for this group might simply be average quality baleage, or a mix of hay and a small amount of corn silage. Most baleage meets the requirement of 10% to 12% CP and 0.44 to 0.48 Mcal per pound of NEL, as do many good quality grass-legume or legume hays. During the grazing season, this group of cows can follow milking cows and graze the lower quality forage left behind. Even though it is of lower quality, it is still higher quality than early dry cows need so you can feed lower quality hay as well if time and labor allow. Free-choice minerals and salt may be offered to this group whether they are grazing or eating stored forages. When dry cows used to eating grain shift to a diet of almost all forage, the rumen bacteria shift from carbohydrate digesters to fiber digesters. This causes the rumen pH to become more neutral and the rumen papillae (finger-like projections which line the inside of the rumen and absorb nutrients) to become smaller, reducing the surface area in the rumen for nutrient absorption. To manage this physiological change, reintroduce grain two to four weeks before calving so the rumen bacteria have time to increase the populations of carbohydrate digesters and the papillae have time to lengthen before grain is increased after calving. This is also important with low-level grain feeding after calving, because if the papillae do not have time to regrow, acid builds up in the rumen and cannot be absorbed. This can lead to metabolic health issues such as subclinical acidosis, laminitis, and ketosis. To keep the cows healthy, the rumen needs to be healthy as well. All certified organic animals over the age of six months are required to be receive a minimum of 30% of their dry matter from pasture during the grazing season (7 C.F.R. §205.237). Therefore, a look at nutritional considerations for heifers is important. Target growth rates of up to two pounds per day are possible on well-managed pasture with little to no supplemental feeding. A little corn meal or corn silage can help the heifers utilize the pasture’s protein more efficiently. Offer free-choice minerals and kelp. Table 5 includes the post-weaning requirements for both small and large breeds of various ages and their nutrient needs. Most of the values are a range because of breed differences and varying growth rates—faster growing animals have higher requirements. These requirements can be met with high-quality pasture or forages and minimal grain feeding. Table 5. Post-weaning requirements for various ages and breeds of heifers. Source: National Research Council. 2001. Nutrient Requirements of Dairy Cattle. National Academy Press, Washington, DC. Heifers between the ages of six months and breeding age (approximately 15 months) have similar nutrient requirements, but their intake needs to increase as they grow. Thus, a group of heifers on well-managed pasture can be given the same ration and, as long as there is adequate quantity, it will meet their needs. This is illustrated in Example 3. As long as the heifers’ pasture is managed similarly to the management of the milking cows’ pasture, the two groups of heifers in this example will easily meet their protein requirements. In fact, they will probably eat a bit more than their requirements, but are able to handle the excess protein more easily than milking cows since their metabolism works more slowly and feed stays in their rumen longer. When heifers are fed stored feeds, feed as much forage as possible to minimize costs. Generally, a good quality hay, haylage, or baleage at least 12% CP and free-choice feed will meet their protein requirements. It may also meet their energy requirements so long as it tests over 0.25 Mcal per pound of NEG. Feed salt and minerals either free choice or top-dressed on the forages. If high-quality forages are not available, then a small amount of grain may need to be fed. To calculate how much protein and energy is needed from the grain, refer to the calculations in Example 1. From breeding to calving, pasture does a good job of meeting nutritional requirements without supplemental feed other than salt and minerals. Some farmers graze this group with the milking cows or use them to clean up a pasture after the milking cows. However, if the farm has a history of Johne’s Disease in the herd, or if animals from herds that are not guaranteed Johne’s-free enter the farm, establishing clean, separate grazing systems for heifers might be the best strategy. Short-bred Holstein heifers at 16 months old would be 900 to 1,000 pounds body weight, and heifers in the last third of gestation at 22 to 24 months old would weigh approximately 1,200 to 1,300 pounds. They can graze together and eat a similar ration, although when they are within a month of calving, they should begin a transition diet similar to a dry cow. Example 4 illustrates how to calculate this transition diet. Confinement rations for 16 to 24 month old heifers must also meet the same parameters as for the younger group and provide enough forage to achieve their intake requirements. If the forage quality is low, a grain mix may need to be calculated to meet their needs. One precaution for growing heifers is not to overfeed high-energy feeds, especially corn silage. Heifers easily gain weight if provided with too much energy, which can cause metabolic problems such as ketosis after calving. If feeding corn silage or another high-energy feed is planned, be sure to balance it with protein feeds such as pasture, hay, or haylage (Crowley et al., 1991). This is critical in an organic system to minimize health problems. As long as pasture is of high quality, it will provide over 13% CP and 0.40 Mcal per pound of NEG and meet the needs of these bred heifers as it did with the younger group. Calves require organic whole milk from birth until weaning. There is currently no approved organic milk replacer allowed by USDA National Organic Program. Young calves have very high nutritional requirements. As they wean and move toward breeding age, their requirements gradually decline. As discussed previously, once heifers are bred, their requirements reduce and they can meet their requirements on quality forages alone. Organic farms wean their calves at different ages and feed whole milk at a rate of 8% to 10% of body weight or more until they begin weaning. Additionally, a calf starter grain can be offered with at least 19 to 20% CP and 0.60 Mcal per pound of NEG after the first few days of life. Starter grains usually include molasses to assist with palatability and are sold bagged or in bulk. Fresh water should also be offered free choice to calves, as this will encourage them to eat the grain. Starter grains assist early rumen development and after they have adjusted to eating it, forages can be added to the diet at any time. High-quality hay is the best forage to introduce first, followed by fermented feeds as consumption of hay increases (Crowley et al., 1991). If a premixed calf starter grain is not available, it can be formulated and mixed on the farm if the ingredients are on hand. To formulate it, use Pearson’s Square as discussed earlier. Typical ingredients in calf starters include corn, oats, wheat midds, flax meal, soybean meal, molasses, and minerals. The minerals usually include limestone, trace mineral salt, and dicalcium phosphate. Be sure your certifier approves the minerals used in formulating on-the-farm calf starter. Consider reformulating it during the grazing season due to the higher levels of protein in the forage. Some farmers do not feed calf starter and keep them on whole milk until weaning. This strategy does work but with a few challenges. Calf starter helps the rumen develop rumen papillae, which are not there when the calf is born but are important to help the animal absorb nutrients. The rumen papillae begin to develop when bacteria are introduced to the rumen from the calf’s environment and when sugars and starches from calf starter ferment, producing acids that stimulate the rumen wall to begin growing papillae. Calves are not able to digest forages well, even if they begin to graze at a young age, until the rumen bacteria multiply and the papillae develop. When calves drink milk, the milk bypasses the rumen through the esophageal groove into the abomasum (the "true stomach") where enzymes and acids help digest nutrients. Thus, it takes much longer for the calf’s rumen papillae to develop without calf starter, as there are few sugars and starches available to ferment. Whole organic milk is valuable, so keeping calves on milk longer to avoid feeding calf starter has financial implications. Before feeding only whole milk, weigh the economics against the possible long-term benefits that may not have an immediate financial return, such as less disease and animals that do not have to be weaned off grain. It is important to offer organic calves forages at an early age, so they begin to learn what to eat and establish a population of fiber-digesting rumen bacteria. Pasture, dry hay, or baleage are good choices, although a small amount of corn silage can be fed as they approach weaning. After weaning and before six months, calves can be fed high-quality forage and possibly a small amount of grain (if they were fed calf starter) because their rumen is not yet big enough for them to meet their requirements with only forage (Crowley et al., 1991). Example 5 describes how to calculate the nutritional requirements of a newly weaned four month-old calf. Use Table 5 to follow the recommended requirements used in the example. Pasture would meet both the protein and energy requirements, but stored forages such as dry hay or baleage need at least 16% CP and 0.30 Mcal per pound NEG. While many farms’ hay crop forages meet this level, farmers usually feed high-quality forages to milking cows. Thus, if these forages are unavailable for the younger calves, their diet should be supplemented with grain. A pound of corn meal would provide 0.67 Mcal, but not enough protein. 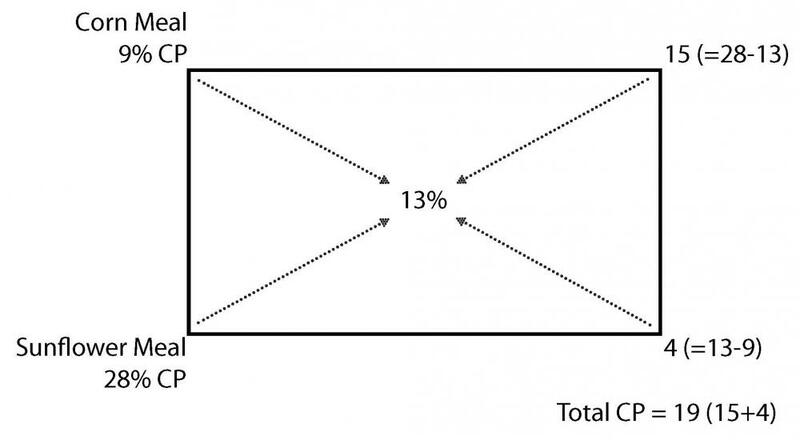 Pearson’s Square indicates that a mix of 31% corn meal (9% CP) and 69% soybean meal (48% CP) would provide the 36% CP needed in the grain. This mixture also provides 0.73 Mcal per pound of energy, exceeding slightly what the calf requires. This should not be a problem as it may help her gain a little more weight. Good organic dairy nutrition will respond by supporting high producing, healthy dairy cows. It is a critical component to a successful organic dairy business. Farmers not comfortable balancing and monitoring feeding rations should find a nutritionist who is knowledgeable about pasture-based rations and the organic rules. Balancing and managing dairy cow rations is a valuable skill and worth spending the time to learn because cows will be healthier, produce better quality milk, and a better bottom line. Hoffman, K., R.DeClue, and D. Emmick. 2000. Prescribed Grazing and Feeding Management of Lactating Dairy Cows. NYS Grazing Lands Conservation Initiative/USDA-NRCS. Available online at: http://grazingguide.net/documents/cow-feeding-mgt.pdf (verified 2012 August 31). Penn Dutch Cow Care [Online]. H.J. Karreman, DVM. Available at: http://penndutchcowcare.org (verified 2012 August 31). Premier Molasses [Online] Premier Molasses Company. Available at: http://www.premiermolasses.ie/silage.htm (verified 2012 August 31).